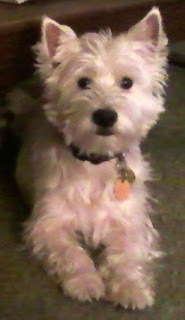 The TSGS Cruiser: "Every Photo Tells A Story"
"Every Photo Tells A Story"
Below is a picture of our little dog... Ollie! He is very hard to photograph because he is super hyperactive! They say that Terriers are naturally very active dogs and they say West Highland White Terriers (WESTIES) are exceptionally feisty! So, what does this have to do with genealogy and where is the story? In this case it is hard to know what the story is since it is just a photo taken at some unknown time somewhere with only the dog. If you know much about digital pics, you would be able to tell it is a modified digital photo, probably taken in the last 10 years or less (it could be older, but not likely). You have good enough features to realize that it is a Westie, which is generally an expensive dog to obtain and to some extent to maintain. You might think the owners had a little bit of money... but not in this case. Ollie was a gift from friends that had too many other dogs to maintain (someone gave Ollie to them). One thing is for sure, the owners took this photo because they loved the dog or they wanted to find it another home by showing the photo to others. In this case the owners loved the little dog. Why did I select this picture for this blog? Well, I just told you that we love our dog... just like all pet owners. We are all proud to show off our pets. How many pets do you see in the photo Christmas greeting cards with the whole family & the pets? We would have been in the photo with Ollie, but it is almost impossible to catch him not moving. Ok, again what is my point? All of us, including our ancestors, are/were proud of our pets, cars/trucks, horses, pistols, rifles, farm animals, homes, etc. You know someone was a hunter or fisherman because they took pictures of themselves with the "catch" which was so important to them and a source of pride! Just take a look at the older pictures in your family and you will see these items in most of the photos... it tells you about the person and what was important to them. You may not be able to know what the story is behind a lot of these photos, but you can learn a little more about the people in them. I will say that people did not have digital cameras until just the last 10-15 years - which means they were using film that cost money to buy it & develop it. You did not always have film for the camera without going somewhere to buy it. Which the genealogical detective in me suggests that they had film because there will be a special event to take photos or there was still film in the camera after such a special event. More often than not, people took photos to finish out the roll to take it in to get it developed. They would pick things that had some value to them or to ensure they had a recent photo of everyone. Like most of us that take photos, we generally make sure what is in the background is appropriate or has some meaning to it. On the farm, you will see the tractor, the barn, cows, horses, chickens or other animals. You might see crops, flowers, a wagon of hay, or other items signifying pride in the farm like a basket of eggs! There is a story in those photos about these people. You may not know what kind of farmers they were, until you see the tobacco leaves hanging in the barn. During your Christmas Holiday & New Years, it might be a good time to look through some old photos to see what stories you can learn from them. Look at the people you know well to see how they told you a lot about themselves in their photos and then apply what you have seen to the ones that you did not know as well. Anyway, it should be a good time to reflect on your family. Happy Holidays, looking forward to a great new genealogical year! Fantastic blog, John. You truly write "from the heart" and that makes your blogs have so much more meaning. Made me think of my past dogs and how much they were a REAL part of my life. I love genealogy!